Want To Sip Your Latte in Paris Courtesy of BOURJOIS Canada? 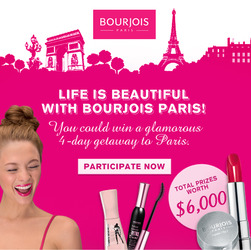 I recently received a newsletter from BOURJOIS Canada and wanted to share some information about this fun contest. It was an easy entry process that I couldn't pass up as they are giving away $6000 worth of prizes. (Grand Prize: 4 Day Trip to Paris. Second Prize: 1 Year Supply of Glamorous BOURJOIS Cosmetics). 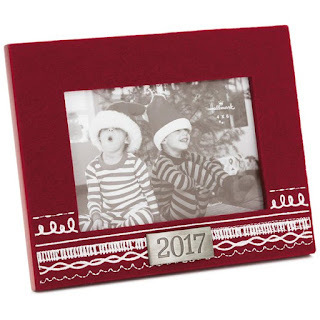 Head over to their facebook page today ~ ENTER before 11:59 PM/EST ! Hint Hint: You may want to visit Bourjois.ca and read about their fabulous mascaras & read the INFO section on their facebook page before entering the giveaway. Life is beautiful with Bourjois Paris! You could win a glamorous 4-day getaway to Paris. The fashion, the food, the allure of the city. Enter for the chance to enjoy it all with the sensational grand prize trip for two that includes airfare, four nights in an elegant four-star hotel and $800 in spending money. The grand prize package also includes a visit to one of Europe’s most beloved cosmetic houses, Bourjois Paris, and $500 of Bourjois Paris products including the cult favourite, the Little Round Pot Blush. Features a year’s worth of Bourjois Paris cosmetics for a look that is pure Parisian perfection! *This message was posted as a result of my involvement with BOURJOIS Canada and their blogger newsletter subscription. Please visit the links provided to find out more information about BOURJOIS Canada and the full terms associated with contest entry. ** Image and links extracted from contact newsletter and BOURJOIS Canada facebook page.